I bet it would taste good using coconut oil instead of butter…not a shredded coconut fan. My loaves are in the oven. I have one dark pan and one glass pan. We’ll see how long each one takes. Glad you told me your dark pan cooked so quick, or I would have totally overcooked mine before I even thought to check on it. I was thinking about you tonight, wondering if you would actually make the bread after such a busy day…hope you love it! wow sounds DELICIOUS!! I can`t wait to try this recipe out. Its funny I was just talking about “digitizing” recipes with a friend today. UGH! I must take this as a sign and get to work! Right now baking bread or sitting in my hot home office sounds like the last thing I want to do in this heat though! 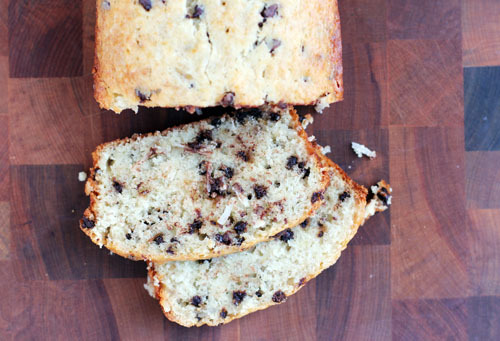 I have some bananas that need to baked with (meaning they are very brown) and I’m so glad you posted this recipe. I love the idea of adding coconut. I hope it cools down a bit so I can bake it. That is such a sweet story…and reminds me of all of the recipe cards I have of my Grandma’s in my recipe box. Your bread looks delicious too…sounds like a great combo of flavours. I used sweetened because that was what I had in the cupboard…but the bread is quite sweet, would be worth experimenting with unsweetened! I’m going to try this recipe gluten free! I love all of the flavors in this bread. I can definitely understand why this cake would recieve such a good reaction – it looks delicious! I love the addition of coconut too. 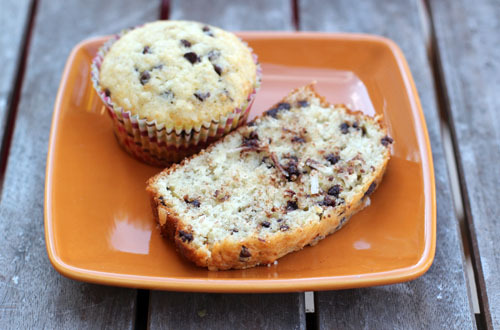 OK – the combo of banana and coconut is so smart! Yum! Wow Yummy! didn’t have buttermilk on hand and the vinegar and milk worked, I used a glass pan and it took 53 minutes and 45 for the metal non stick, just had some warm with a little butter was AMAZING!!!! I’ve used this recipe twice already since stumbling on it; it’s soooo good. Think the only thing is that I’d wish for it to be more filling. Would eat a small slice and want to eat so much more. Delicious recipe. Just baked half in a bread loaf pan and the rest of the batter into mini muffins and my house smells wonderful. Can’t wait to share at work and with the fam. Thanks! really tempting recipe, I’ve made some in the oven right now. does the flour need to be sifted though? I may have missed that bit. I’m so glad! it is amazing how light it is, right? 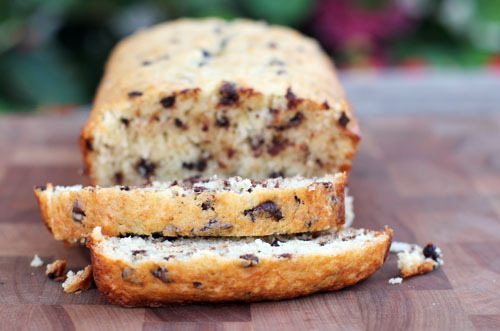 not what you expect from banana bread…I love it! I have got to give this a try. My husband would love it! I used 1 cup sweetened coconut shavings and omitted the 1 1/4 cup sugar. They tasted amazing! I just made these w/o coconut and used chopped walnuts. We are circling the kitchen waiting on them to come out! hope you love it! 🙂 I bet your kitchen is smelling wonderful right now! 5 Rating from me!!!! I’ll be making these again! I printed out this recipe years ago and have made it a few times since then. I made a batch yesterday to bring into my office and it turned out SO WELL! The inside is so moist, and the crust is perfectly crisp without turning tough. I love the addition of coconut. With the amount of batter the recipe makes, I made 1 loaf (filled ~halfway) and a 9×9 square pan. A+! your comment just makes me SO happy, thank you!!!! !